I love shopping. I love online shopping. I love finding things that are rare, not from the same mould as others – or if they are it has to have a seriously high dose of what The Mister calls ‘Hollie Flavour’. I love trawling etsy and, while I’m yet to compile an etsy treasury, I do favourite a LOT of beautiful wares. Clothing, accessories, graphics, furniture, home wares, pretty much anything goes. If I love it, I find that heart and make it my dream. Friday Finds is a little bit of everything that I am fawning over that perhaps one day you or I can add to our collections. 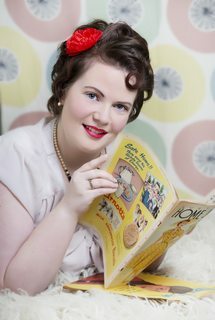 There’s no hard and fast rule as to where things come from, just that they possess that certain element of Hollie Flavour and of course, a hint of 40s or 50s doesn’t go astray. There are so many things to try and squeeze into this first Friday Finds, but I’ll try my best to not overwhelm either of us with too many things! I might have mentioned to you before that I design invitations and stationery. 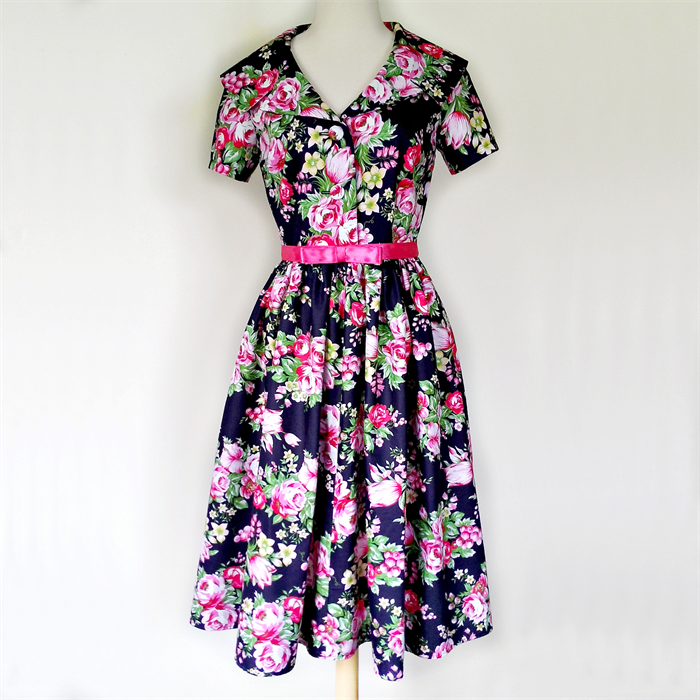 I stumbled across this gorgeous dress (handmade in Australia) on Made It, a platform that I sell my wares on. Custom made from size 6 to 26 and in such beautiful fabric, how can a girl say no?! 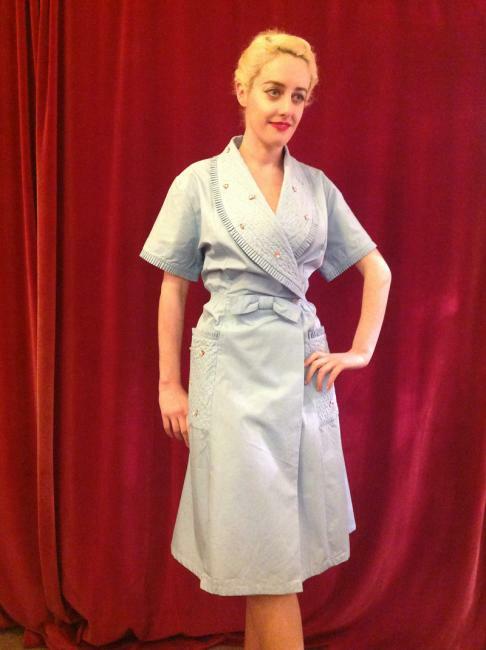 Hollie Flavour test: Navy, floral, dress, a nod to the 50s, handmade. The hints of pink aren’t too bad either. Some days, I want my bag to be a little plain but I also to have a little bit of colour and cuteness. 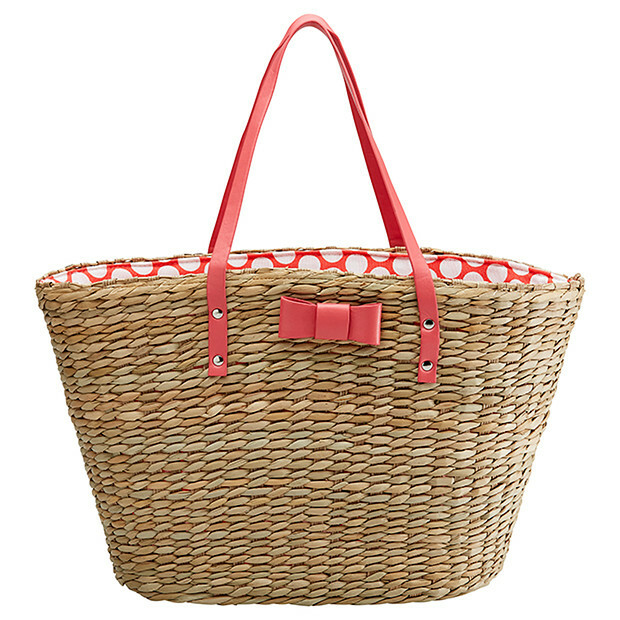 Hello there, Straw Bag with a bow and polka dot lining. Where have you been all my life? Hollie Flavour test: Bag, bow, polka dots, perfectly plain to go with everything in my wardrobe, vintage-inspired. Oh my, isn’t she beautiful? I would LOVE to have this house dress. I’m forever lazing about in The Mister’s robe, but I imagine I could do anything in this dress from washing up to lying on the couch reading a book. Hollie Flavour test: Blue, floral, bow, 1950s. I want an apron. No, I want lots of aprons. I think this one would be a fabulous way to start my collection. 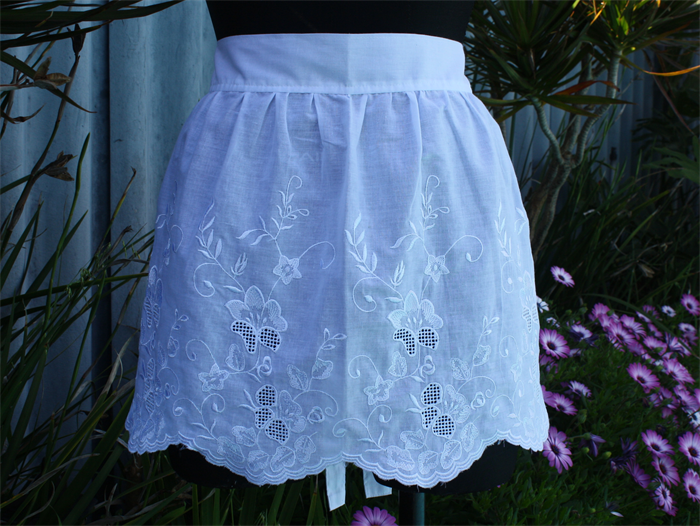 Beautiful handmade half apron in a gorgeous embroidered fabric from Neddy Nibbles in Perth, WA. Hollie Flavour test: Pretty, floral, vintage-inspired, handmade. The beauty of this piece takes my breath away. Look at those stunning AB rhinestones would you? The design is exquisite: is it a snowflake?, is it a star burst?, or is it a flower? Make of it as you please. This one sure would look great on my dresser, and then on my lapel. 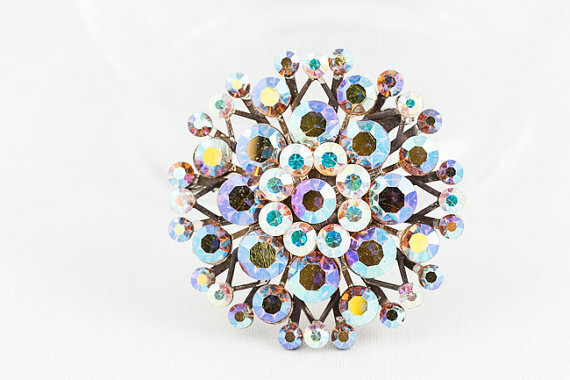 Hollie Flavour test: Jewellery (jewelry), sparkly, shiny, pretty, brooch, 1950s. 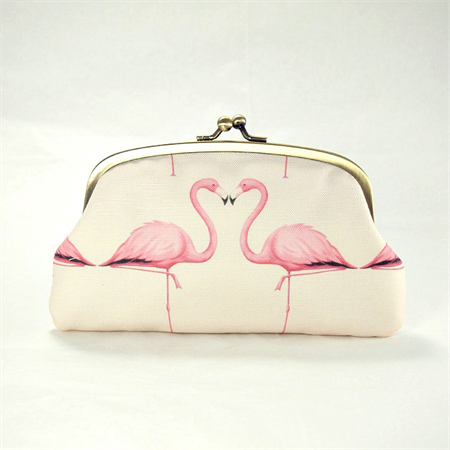 What’s not to love about a flamingo purse? Handmade in New South Wales, Eleven Roosters’ products will get you in every time. The only reason this one (or any others for that matter) aren’t in my possession is because I’m still finishing my studies! Hollie Flavour test: Flamingos, purse, kiss lock, vintage-inspired, handmade. That dress! It’s so gorgeous. I think I’ll have that one in mind when I get to making a shirt dress later in the year. It’s divine, it truly is. Tina’s one talented lady, and I would love to have one of her dresses in my collection.